I’ve long believed the world can be a difficult place and I’ve begun to think that as a society we seem to focus on the negative rather than positive. This is a nice story about some good people doing things for the right reasons. As a disclaimer I will say that, yes, I work for Neil (and his wife Nancy), but would be writing this whether I knew them or not. The original story was broadcast last Wednesday, the 24th, and has unfolded over the past week. Neil just happened to be watching the news and it started a chain of events that will put a smile on your face. 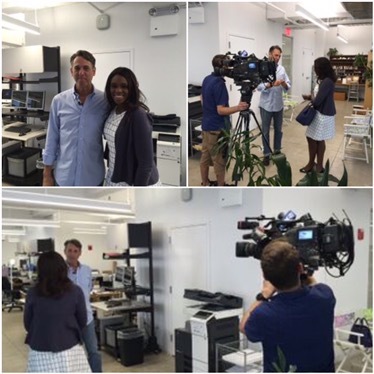 Ayana Harry from WPIX interview Neil. here is the broadcast of the story. Neil & Tanya at the Libertad Urban Farm with the new tools. It’s nice to hear about everyday people doing good for others. Neither Neil, nor Tanya were seeking any praise, but simply looking to make a difference. Kudos to both of them. If they’ve inspired you, do something in your own neighborhood or donate to the Libertad Urban Farm HERE. Very nice story, terrible that it happened. Neil, one of the good guys.